Lancia Beta Forum > Technical stuff > Electrical > Replacing the indicator relay. I have the rather annoying and MOT failing single flash followed by fast clicking problem with the indicators. This for the second time. Last time I had to buy a used relay from Felix Furtak in Cape Town. I've read the various posts in the archive that suggest cleaning and uprating the earths and I'll go round those things again. I've also read the bit that suggests bypassing the reed relay. I don't think the unit I have can be opened but if it can be I'll have a go. Seems to me that the best solution might be to fit an electronic type instead. I see that it is suggested that a Thema flasher unit is good. So, can anyone tell me whether ALL Thema types are electronic? Is there a more detailed description or a part number for that? Does it fit the same connector or is rewiring needed? Failing that can anyone suggest a unit that has been successfully fitted as a substitute? Or am I going to have to work it all out from some other makers unit? As always, I'm grateful for any help. I have a few weeks to make it work. Re: Replacing the indicator relay. Re: Replacing the indicator relay. Update and Solution. As I said I would I tried all the things that were suggested to improve the condition of the indicator relay. Cleaned all the earths and replaced crimped joints with soldered joints and heatshrink. No apparent difference. It did cross my mind, however, that activating the hazard light caused them all to work in the manner expected and that therefore they are adequately earthed. The lights are bright as indeed they were before I attempted to improve the earths. I opened up both of my similarly challenged units and, although different in execution from different manufacturers, they both have a transistor based flip-flop circuit with suitable capacitors and resistors to give a time constant for the period of the blink. Depending on the current that is being drawn through one of the transistors in the 'on' phase of operation the time constant is shorter if one or more of the turn bulbs has blown. In normal proper operation the click becomes faster. So the liklihood is that one or more of the capacitors has changed in value probably by absorbing moisture as old electrolytics do. Additionally (and there are differences here in between the makers) there is a parasitic coil with a reed relay that gives rise to the dash brake light flashing. The suggestion of soldering the a bypassing wire onto the reed relay has the effect of reducing the impedance of the parasitic coil, drawing more current and making the circuit nearer to the draw that normally arises when the system operates normally. I should say that this part of the circuit will always draw some small amount of current even in the idle state. If this works for you then it is only because you have been lucky that the small increase in current drawn by this mod moves the current drawn over a threshold and back to normal operation spec. It did not work for me on either of the examples I have. So , at this point, I decided that it was all too marginal and instead of replacing all the caps and resistors that it would be better to replace the whole unit with a new one so that others can also have benefit of the change. 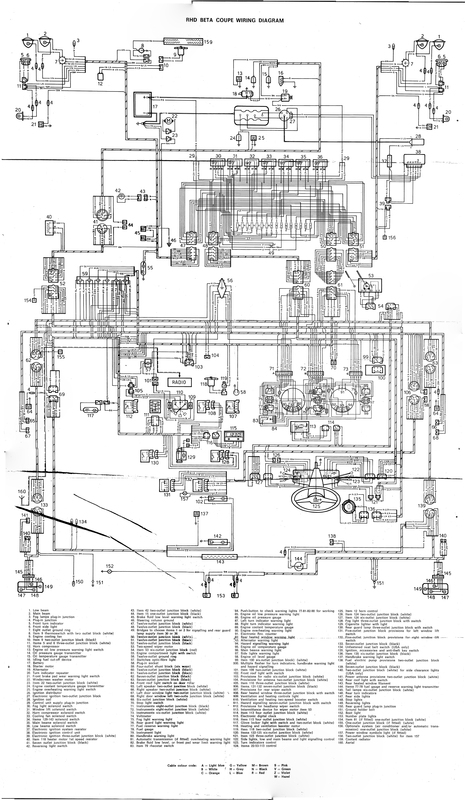 I should say that I searched the internet for a better circuit diagram and came across this which matches all the wiring colour codes on my Beta , a 1981 RHD, 2.0 carb type. I would like to express my gratitude to the kind person that scanned and posted the diagram. http://farm4.staticflickr.com/3091/5866922555_a300d4ab87_o_d.jpg . The circuit diagram tells us that the green and black lead goes to the handbrake and is earthed when the handbrake is on. Black is the earth (as always). Powering on the ignition without the flasher relay attached gave me 10.35V on the Yellow and 9.06V on the sky Blue. All the others were 0V or close to it. I connected to the skyblue and with the ignition on brushed the other end to earth and the handbrake light came on. That leaves the yellow as the fixed ignition +ve. Any 100W flasher unit will work. Connect pin 49 to the yellow. Pin 49a to the white. Pin31 to the black. Smile when the indicators work. I found that the receptacles in the red connector were not as tight as I would have liked so I taped them in place with black insulating tape. I believe that when hidden in the shrouding on the steering column it will not be a problem. I may try to find a suitable mating connector and replace it since it is not quite the high standard of finish we aspire to. You can also connect pin 2 on the connector to pin 3 on the connector. The handbrake light will still work when the handbrake is on but will not flash.